The TechKnow Edukit offers products that will fascinate kids with the wonders of Robotics, Scientific Discovery, Simple & Compound Machines, and much more. It will spark your kids interest in these fields. The complete Kit with the course is designed by our team of Engineers and referred by Teachers and Parents with one purpose in mind- to combine fun with learning. These are specifically designed activity kits. With this kit, students explore scientific concepts and apply them. Each kit has 8 unique activities which consist of experiments, simple machines and a Logical Robot. 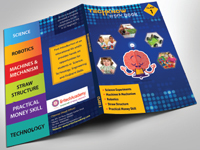 The TechKnow Edukit comes with a detailed manual and exploration guide with color illustrations, How to do, Interesting facts and a lot more. Our belief has been that applied hands-on experience has always been more effective than conventional education and we strive to make a student an all-rounded successful individual.